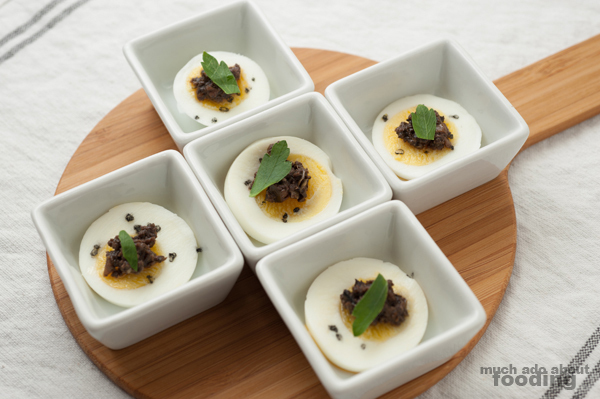 I made these little egg bites one day just to try out an idea I had in mind...and to finally boil some eggs. I had to admit that I've only really boiled eggs once or twice before because I don't normally eat them like that. For this particular appetizer combination I thought of making, it was necessary. This gave me time to also try to perfect the method. I think it turned out just about right! The bites look beautiful in small dishes/bowls but could also work in spoons. After all, they really are just one bite bites! I noted 4-6 eggs because the serving size depends on how thick you slice the eggs. You are to make 24 pieces overall. To boil these, in a pot, boil enough water that would cover the eggs a good fingertip over in water. When boiling, lower straight-from-the-fridge eggs in slowly until submerged, cover pot, and turn off heat. Let sit for 7-8 minutes before removing and placing into a bowl of ice water. Then refrigerate eggs. 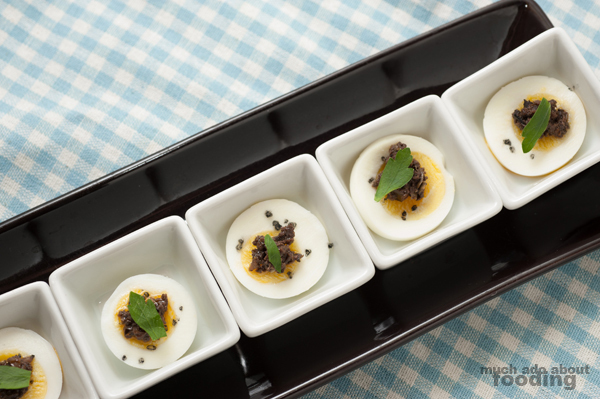 Peel eggs and slice into 24 pieces. 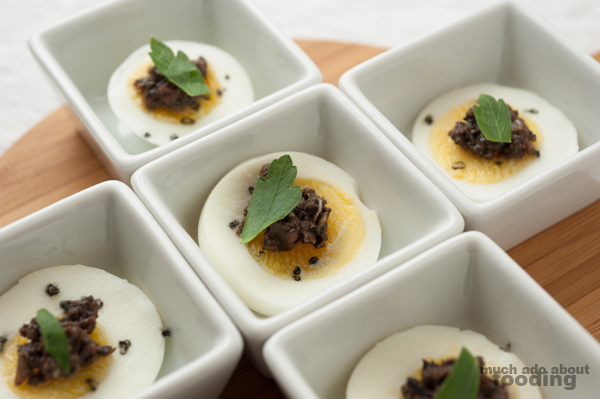 Lay flat and dollop on tapenade. Add one drop of spicy olive oil over tapenade, sprinkle with sea salt, and garnish with one small leaf of parsley. Enjoy!